There’s something magical about a college town. From the leafy green spaces of campus to the nearby strip of cafes, bookstores and bars, college towns at their best are charming yet vibrant places to live. They attract artists and philosophers, spurring creativity on and off campus. This is SmartAsset’s second annual study of the best college towns to live in. Read the 2016 study here. At the same time, colleges and universities often serve as a local economic engine, providing stable, well-paying jobs that support the entire community. Of course, not all college towns are created equal. To find the best college towns to live in SmartAsset looked at more than 100 cities and towns that are home to a four-year college or university. Princeton beats Harvard. 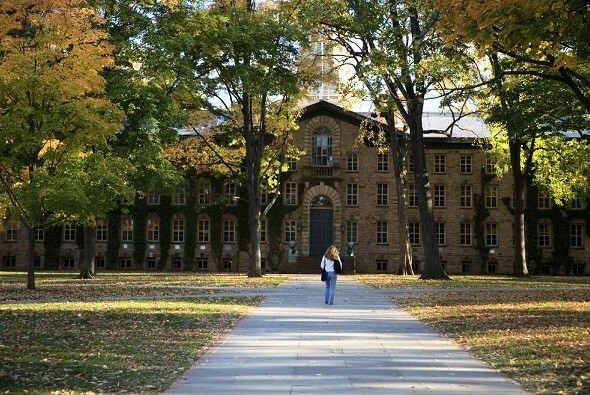 Princeton and Harvard have the oldest rivalry in higher education. They are also located in two of the country’s best college towns, ranking first and sixth in our study. Princeton ultimately edged Cambridge (which is also home to MIT) because of lower crime rates and higher discretionary income. 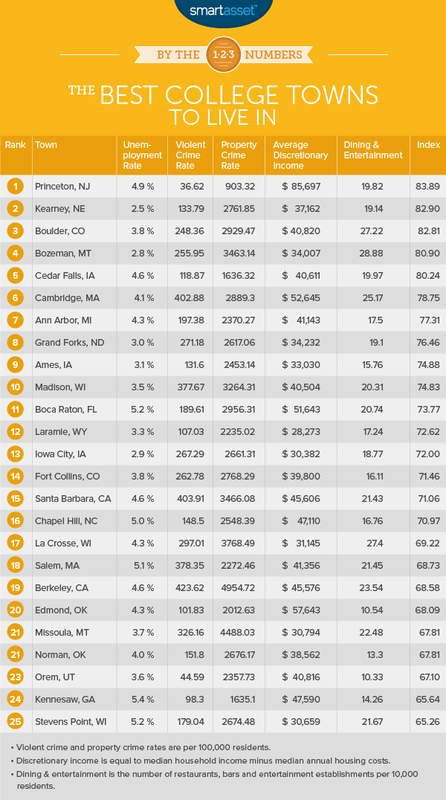 Top towns in the west, Midwest. Eight of the top ten college towns are western or Midwestern towns that are home to a public university. Flagship research universities in places like Boulder, Ann Arbor and Madison employ thousands of people as faculty, administration and staff. Princeton University routinely ranks among the best academic institutions not only in the U.S. but in the world. It has produced presidents, Nobel laureates, astronauts and billionaires. It has an iconic campus and traditions that predate many U.S. states. With all the recognition poured on the university, it is easy to overlook the town in which it is located. That would be a mistake. Princeton is among the safest college towns in the country. The town’s violent crime rate is second lowest among college towns, while the property crime rate is third lowest. Additionally, despite its location between two of America’s largest cities (New York and Philadelphia), Princeton is relatively affordable (although homebuyers should keep in mind the state of New Jersey’s high property taxes). This central Nebraska town has the lowest unemployment rate of any college town in America at just 2.5%. The University of Nebraska’s Kearney campus is the largest employer in town but other important industries are health care and retail. Despite its small size (the population is about 31,000), Kearney rated well for its dining and entertainment amenities. According to the U.S. Census Bureau, there are 14 bars in the Kearney area and 32 restaurants. For the second year in a row, Boulder ranks as one of the top 10 college towns in America. Boulder is known as one of the cultural capitals of the west and our findings support that reputation. The city has over 27 dining and entertainment establishments for every 10,000 residents. This is the fourth highest of the 108 college towns in our study. Located in western Montana, just a few hours north of Yellowstone National Park, Bozeman is the perfect college town for those who love the outdoors. It is close to some of the country’s best fly fishing, skiing, backpacking and mountain biking. It also has a booming economy with unemployment at just 2.8%. Cedar Falls ranks as the fifth best college town to live in thanks to its low crime rates and low cost of living. According to the U.S. Census Bureau, the average annual housing cost in Cedar Falls is just $9,936. Nonetheless, there is plenty to do in the Cedar Falls area. Try SmartAsset’s free student loan calculator. The city has nearly 20 dining and entertainment establishments for every 10,000 residents. This ranks 17th of the more than 100 cities in our study. Sports fans can also catch one of the University of Northern Iowa’s 17 different varsity sports teams, with games taking place throughout the year. Along with being the sixth best college town to live in, Cambridge is also one of the oldest. New College, which later became Harvard, was founded in 1636. Shortly thereafter, the town renamed itself Cambridge, taking the name from the English university. Today Cambridge is home to two of the world’s leading universities (Harvard and the Massachusetts Institute of Technology). The presence of those two schools has turned the Cambridge area into a magnet for high tech companies: Google, IBM, Microsoft and Amazon all have research offices in the area. Ann Arbor, also known as A-Squared or the Ace Deuce, is the quintessential Midwestern university town. It has shady streets that explode into color in the autumn, shortly after the students arrive. Football Saturdays are a spectacle in Ann Arbor, as tens of thousands of people fill the streets before and after the game. While the town is a bit quieter the rest of the year, the cafes and bars along South University and Main Street are popular among students and townies alike, regardless of season. Grand Forks is home to the University of North Dakota. It has the fourth lowest unemployment rate of any college town in America at 3%. College hockey fans will be especially keen on Grand Forks. Along with rating as one of America’s best college towns to live in, it also ranked as the country’s top hockey town. With a population of just over 60,000, Ames is a mid-sized city with the charm of a small town. It has safe streets, with violent and property crime rates among the 25 lowest of the college towns in our study. Yet at the same time, it has a flourishing economy. Unemployment in Ames is just 3.1% and population growth in recent years has been strong. Though Madison serves as the state capital of Wisconsin, it is a college town above all else. The University of Wisconsin ranks as one of the best schools in the country and has a major influence on the town’s culture and economy. Walk around Madison’s downtown area any day of the year and you are sure to see someone in the Badgers’ cardinal red. To find the best college towns to live in, SmartAsset collected data on every U.S. city or town that is home to a four-year college or university. That list included places like New York City, which has a number of universities but is not anyone’s idea of a college town. Therefore, we narrowed our focus to all towns with a population of at least 25,000, in which the total enrollment of all local colleges and universities was greater than 20% of the total population. That left 108 college towns from across the country. For those 108 towns we looked at five separate metrics: the violent crime rate, the property crime rate, the unemployment rate, the median discretionary income (median household income minus median housing costs) and then number of dining and entertainment establishments per 10,000 residents. We ranked every town in our study on those five factors and then averaged those rankings. In calculating the averages, we combined the rankings for violent crime and property crime, giving 70% weight to violent crime and 30% weight to property crime. The other metrics all received 100% weight. Lastly, we assigned a score from 0-100 to each town based on its average ranking. A town that ranked first in every metric would have scored a perfect 100, while a town ranking last would score a zero. This methodology represents several small adjustments from the methodology we used in 2014. Last year, we considered per capita income instead of household income. Last year we also looked at average rent. This year we used average housing costs (which includes things like mortgage payments, insurance and taxes). Data on violent crime and property crime rates came from the FBI’s Uniform Crime Reporting database as well as local police department websites. Data on the unemployment rate came from the Bureau of Labor Statistics. Data on median annual income and median annual housing costs came from the U.S. Census Bureau, as did data on the number of dining and entertainment establishments per capita.